This post is part 1 of a review series on A Feast of Ice and Fire. The awesome ladies over at Inn at the Crossroads released their official Game of Thrones cookbook, A Feast of Ice and Fire, last month and I was lucky enough to get two copies to review and give away. When it came I paged through it gleefully, happy to finally see a “fictional food” cookbook that had images. I’ve got two of the Adams Media cookbooks (one for Harry Potter and one for The Hunger Games) and they’re always a huge disappointment to me because they fail to do what I think fictional food blogs and books are supposed to do, which is bring what’s already in word form into picture form. To me these cookbooks are supposed to not just help you figure out how to make what you read about and imagine, but it’s supposed to bring those recipes to life with visuals. When Harry eats bouillabaisse at a feast while trying not to stare at the girls from Beaubaxtons, I want to know what it looks like, not simply read words on a page. This is thankfully not the case with this official cookbook by Chelsea Monroe-Cassel and Sariann Lehrer, who are true fictional foodies like myself. Every recipe in their book comes with a full color photograph and a quote to go with it. And while they’re not all full page or anything, I can see where that would get expensive and leave an author with less area to write about the recipes themselves. The great challenge in cooking food from George R.R. Martin’s imagination is that he tends to describe entire meals in a single sentence. Sit down for a meal with Tyrion and you’ll find yourself with sweetcorn fritters, oatbread with fruit, and roasted boar. Chelsea and Sariann tackle this by quoting the book and then giving you page references to all the other recipes needed for it. 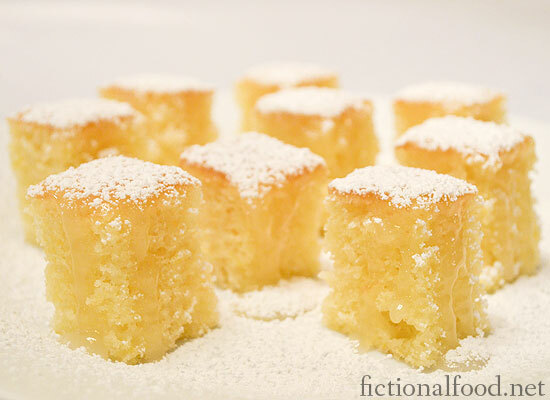 While choosing what to make first I have to admit I disappointed myself because I’ve already made the HBO lemon cakes, but I just couldn’t help myself. 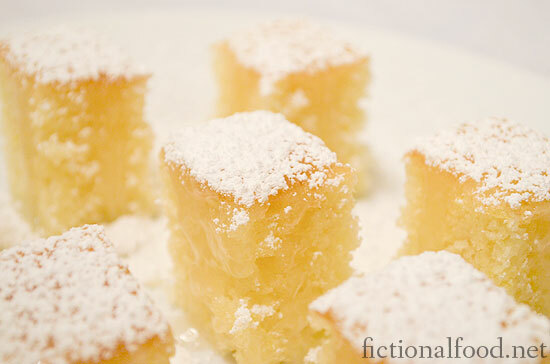 The lemon cakes in their book had two versions, one modern and one Elizabethean. I intend to make both versions, but for now stuck with the modern recipe because it looked so yummy in the book. Sadly, mine look nothing like their picture, so I have to email Chelsea and figure out where I went wrong. Mine just look like a box cake with a clear lemon glaze on it. It might be that the photo I was looking at was made with the Elizabethan cake recipe when I thought it was the modern one. 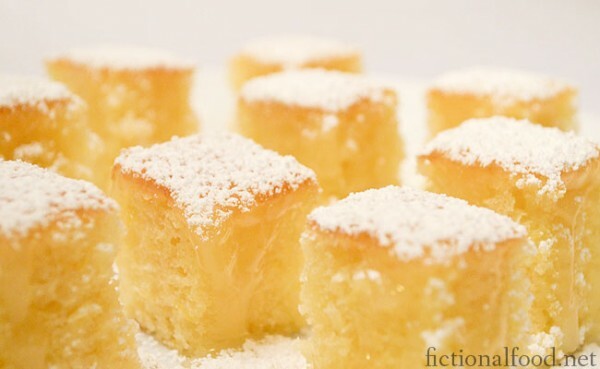 Not satisfied with an invisible icing, I decided to just go ahead and rain down some confectioner’s sugar since the book describes them as frosted in sugar anyway. They looked much better after that, though I obviously can’t cut perfect little squares to save my life. Here’s another look at them from the top. My daughter loved them, but agreed with me that the HBO ones packed more lemon punch and the two of us are huge lemon fans. Those are for people like us, since my husband scrunched his face up and described them as having “punch you in the face lemon taste”. 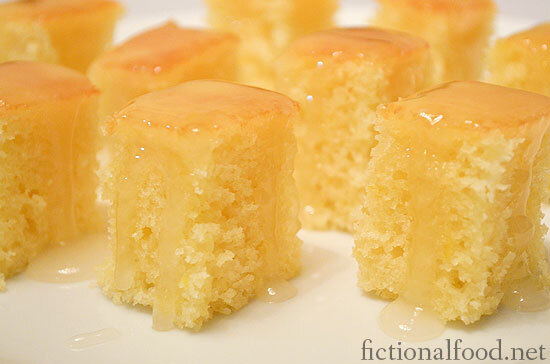 This lemon cake was much more his speed, with a light lemon flavor to the cake and a nice sweet lemon glaze. Stay tuned for Part 2 and a giveaway during my review series!